Police yesterday launched an investigation into an incident where a group of persons participating in the Paada Yathra has allegedly attacked an ambulance and damaged the vehicle near the Peradeniya police station. The road leading to Kandy had been blocked by the people participating in the Pada Yatra opposite the Rajapavonaramaya temple in Getambe. The vehicle came under attack as the driver switched on its sirens to disperse the crowd blocking the road. The crowd enraged by the sounds of the sirens, asked the driver as to why he switched on sirens , when there was no patient in the ambulance. They later attacked the vehicle. The side mirrors of the ambulance were damaged after this group of persons allegedly attacked the vehicle. 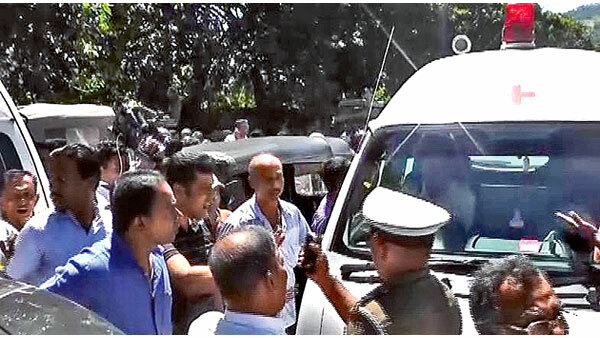 This ambulance belonging to a private hospital in Kandy was bound for the Peradeniya Teaching Hospital to remove a patient , when the incident occurred. Police investigations commenced after the driver and the assistant of the ambulance made the complaint. Is the driver supposed to stay put until the march goes past him or does the ambulance driver has the right to go past to his base waiting for a call. Doesn't these stupid Pada Yatra organizers know even that! Of course how can they ? They are crooks, killers, drug dealers and all corrupt people there!